Place cut carrots, turnips, and onion on a metal sheet pan, toss with 2 tablespoons vegetable oil, a pinch of cumin, and kosher salt and freshly-ground black pepper to taste. Roast in preheated oven for 20-25 minutes until brown, mixing halfway to ensure even browning. While vegetables are roasting, prepare matzo balls according to package directions, but with a few "secret" changes. Crack 2 eggs into a medium glass bowl. With a fork, beat egg whites first, and then incorporate yolks: tilt the bowl to one side and "pull" whites up and beat until frothy. Then break yolks and beat together until light yellow and bubbly. Add remaining 2 tablespoons vegetable oil and whip again until fully incorporated and bubbly. Add packet of mix and stir just until combined. Combine 4 cups Manischewitz® Vegetable Broth, 1/2 teaspoon kosher salt, and 1/2 teaspoon ground cumin in a 4-quart pot, bring to boil over medium-high heat. Remove matzo ball mix from fridge, form into balls with hands, just under the size of ping-pong balls, about 8. Drop into broth, cover, and lower heat and simmer for 12-15 minutes. When vegetables are finished roasting, remove from oven. 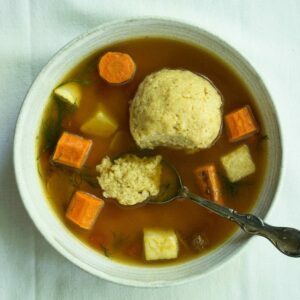 Remove cover from pot and add remaining 2 cups Manischewitz® Vegetable Broth and diced tomatoes. Add vegetables, and bring soup to boil over medium-high heat. Cover and reduce heat to low, and simmer for 10 minutes. Uncover and add salt, pepper, or cumin to taste. Serve, and enjoy!